Whey Force – High Whey Content on a budget! Bodybuilders take a lot of protein supplements, which may become expensive and hard to sustain. Especially if you are a student or just became a pro bodybuilder recently, chances are you want to get results without spending too much. But you also know that to achieve results, Protein is something that you cannot sacrifice. We know this too, so we provide you with Whey Force – from Gold Nutrition’s Extreme Force Line – a whey supplement where only the price was sacrificed! Whey Force provides you with 21g of Whey Protein in each fantastic-tasting serving. Whey protein is the most popular choice among veteran and amateur bodybuilders because of its complete amino acid profile. Whey protein's distinct property is its fast absorption and digestion rate. Right after consumption, Whey Force starts delivering amino acids (the anabolic building blocks of protein) into your muscles – wasting no time in triggering protein synthesis, muscle growth and muscle tissue repair. Whey Force is also an excellent source of BCAAs, giving you 5.2g of BCAAs per serving. These BCAAs keep your muscles protected from muscle destruction and also promote muscle growth. Get high quality whey protein, with the fantastic taste that Gold Nutrition already accustomed us, for an unbeatable price. Get Whey Force. Have a question about Whey Force? What is it, what does it do, how and when to use or something else? Ask us. “Whey Force 1kg” is currently out of stock. Enter your details below and we will let you know when it's back in stock. 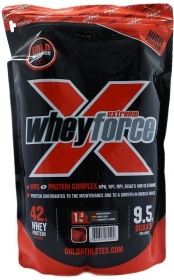 Whey Force 2kg is a discontinued product. Please browse other products you might be interested in..
ALLERGEN INFORMATION: Contains Phenylalanine!,Contains egg, milk, and soy. Mix 1 (35 g) in 200 ml of water. Consume 2 servings a day. WARNINGS Whey Force : Do not use if pregnant or lactating. Not recommended in cases of renal insufficiency or allergy to any of the constituents. Food supplements should not be used as a substitute for a varied and balanced diet and healthy lifestyle. Store in a cool, dry place away from children.